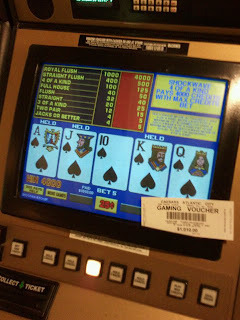 I went to Atlantic City for a night to help my friend celebrate his brother's 30th birthday and to make some money to help fund my postseason baseball, football, and travel adventures. Let's see... I've done a few posts on AC before so let's hit the highlights. It was October 1st. It was the first of the month, a Friday, and a pay day. The casino had a good, lively crowd. Wait... That reminds me. Here's Johnny Kemp's, "Just Got Paid," video. You're welcome! Noodle bar at Caesars still rocks. I recommend the lobster fried rice and chicken lettuce wraps. Dinner was free thanks to the reward credits we had. Woohoo! What's better than a good, free dinner?!? Haha. 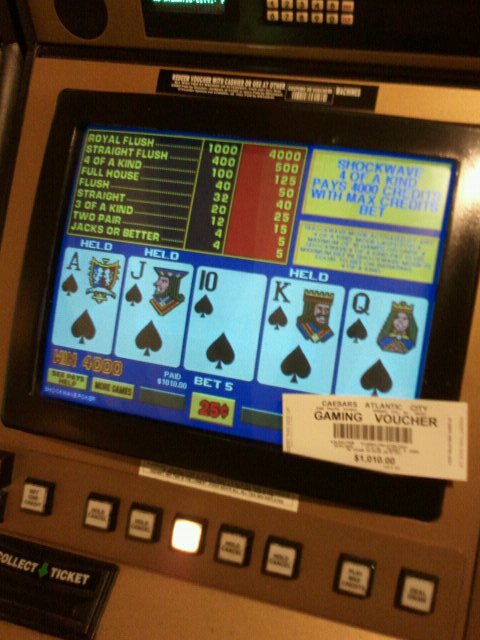 Pat won $1,000 on video poker when he landed a royal flush that payed 4000X1. When he hit it, he hit me in the arm to show me his screen. I couldn't believe it. He had to print and show me the ticket before I believed him. As we were playing and earning tier credits, I'd ask him questions about which cards he usually saves. He made the comment that he always tries for the highest pay out, which makes sense﻿. How can you expect to land a royal flush if you don't hold the cards you need for the hand? I'd like to think I helped him pick the machine since I chose the one on the end towards the right and he took the one to my left. He didn't even play with his own money, since he was using the slot dollars Caesars gave him. Talk about lucky!!! I have been thinking about "dealer signature" lately when it comes to roulette. I made about $400 on the roulette table when 13 and 28 hit at least a couple of times each. I do think though that if put to the "test" and asked to spin for a particular number that almost all dealers would fail this "conscious" challenge. Regardless, if you're curious you should "Google" the topic and investigate it further. I learned how to play "don't pass" in craps since the tables were so cold at the Tropicana. The dealer was helpful and I was able to capitalize on the terrible luck of the brave souls who decided to throw their money away. I never liked "don't pass" players until I became one. I still don't really enjoy the "don't", but at least I'm more educated about it now. I left the casino a winner. On my last stand at the craps table, I was up $500. I buy-in with $200 and I had more than $700 in my rack. I gave most of that stand back, but still had a lot of profit from the night before so I was still good. Although I left AC with $500 in profit from the whole trip, I'm still kicking myself for not leaving with $1,000!!! When I was at the table, a Delonte West looking guy came over and started rolling the dice. I have no idea how he did it, but he was a very good shooter. I took one look at his girlfriend and thought to myself, I need to get a man like that." OK... I might have a problem now. LOL. There is a 7-foot metal giraffe sculpture that sells for $500. I saw it in a store at The Quarter in the Tropicana. The next time I clear $1,000 I'm buying it. Forget a Christmas tree... I'm going to have a Christmas giraffe!!! !